There are many products claiming to be “sports sunscreens” but few live up to the true needs of sports people who are performing or competing over long periods in intense, hot and sweaty conditions. SolRX created their trade marked and closely guarded secret, WATERBLOCK Technology, which ensures that it will last for extended periods of time, in and out of the water without being washed off your skin. This same technology ensures that the sunscreen adheres to the skin and does not sweat out - that means no stinging in the eyes and no loss of performance. SolRX is also a non-greasy sunscreen so you won’t suffer from poor grip or slippery skin. The ultimate proof of this is the number of athletes across the world such as cyclists, ultra-marathon runners and windsurfers who use SolRX to protect their skin whilst competing at the top level of their sport. 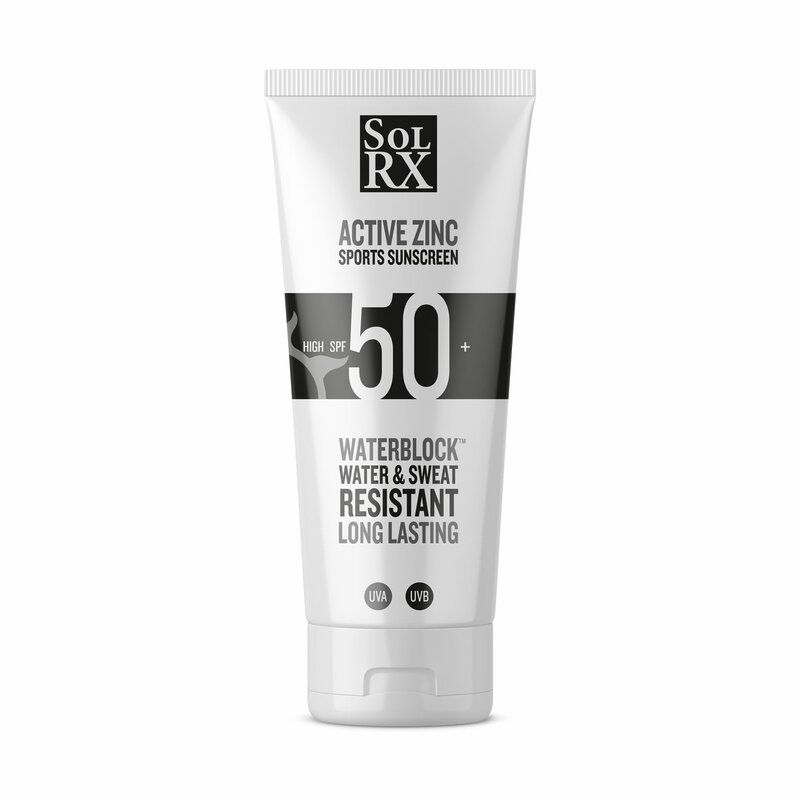 SolRX is the only Sunscreen to use the WATERBLOCK™ system. Within the SolRX waterproof system are what are known as volatile silicones. The Sunscreen, while its state in the tube is not waterproof, becomes waterproof once applied to the skin. Part of the waterproofing ingredients changes chemical structure and part of it evaporates into the air, allowing the waterproof agents bond to the skin. There is no body core heating with SolRX which could be experienced with other sun protection brands. This not only ensures that it is water and sweat resistant (so it cannot run into your eyes) but also makes it feels light on the skin and, being non-comedogenic, it allows the skin to breathe. To make a lotion, traditional manufacturing methods use what is called an oil phase and a water phase. The various ingredients in the lotion are segmented into these phases, mixed, heated and blended. In every lotion, there are ingredients which hold these two phases together during the process. What SolRX has accomplished is unique, we take the sunscreens and use the mixing of those as the oil phase; therefore, no additional oils are needed. This is how SolRX sunscreen achieves its performance whilst also being an oil free sunscreen. Many have tried to copy this process but none so far have managed to match the performance that our athletes demand. SPF in sunscreen stands for Sun Protection Factor (SPF), but SPF only indicates the level of UVB protection, not UVA. We have found that the SPF’s of SolRX sunscreen, even after rigorous testing, have kept their SPF rating or better so we have a + sign to say that we have total confidence in the SPF rating to perform at least the rating on the pack, if not better. Will high SPF give less tan? How do I choose the right SPF? The choice of the sun protection factor depends on the time that your skin can be exposed to the sun without getting sunburned. Be especially cautious at the beginning of the season and your holiday when your skin is light and extra sensitive. On average, the time that the skin can be exposed to the sun without sun protection is estimated between 5 and 30 minutes depending on your skin type. You should choose an SPF depending on your skin type and how long you will be exposed as well as how happy you are to keep applying. We get asked this a lot by our customers and the answer is that SolRX should not stain your clothes if applied properly. That means applying it and leaving time to dry before putting clothes on. For more details on how to best apply SolRX please see notes in the section below. Is SolRX new in the UK? Yes and No. Until recently SolRX was available in the UK under a sub-brand name SolRX PRO SPORT but has now been re-packaged solely under the SolRX name in line with the global expansion of the brand. The UK initial range contains a mix of our original formula and active zinc formula products. As we move forward we will be extending the range and welcome feedback so if you have any comments or questions please contact us. How should I apply SolRX? It is best to concentrate on smaller areas with small amounts of sunscreen, then moving on to another area, ensuring complete and well-absorbed coverage. Avoid applying large amounts in a single go as you will find that it does not get equally distributed. Over application, especially with zinc (mineral) sunscreens can cause skin dryness. To ensure the best performance of your SolRX sunscreen you must apply 20 minutes before exposure to the sun or to moisture as this time will give the sunscreen time to bond and activate on your skin. Efficient and complete application is essential to ensure the performance of SolRX sunscreen – if in doubt “let it dry, then reapply” to assure you are covered all over. Allow it to absorb and dry before contact with clothes and towels etc. Always use other methods of protection from the sun along with your SolRX sunscreen. This can be done by wearing protective clothing, hats and sunglasses to protect your eyes. And also by seeking shade. SolRX sunscreen should be stored in a cool dry environment. Keep it out of direct sunlight and always put the lid back on firmly. Excess heat will affect the structure of the lotion and could cause separation of ingredients, which will render it useless. So, don’t keep it on the dashboard in your car and always keep it in a shaded cool place; like your kit bag or with your lunch in a cool box. Always replace the cap or lid after use. SolRX contains ingredients which enable the sunscreen to bond to your skin, helping to create the water resistant long lasting effect. These ingredients activate with exposure to air, so if you leave the lid off, the sunscreen will dry out; just like a tin of paint would. Sunscreen should be stored in a cool dry place. Excess heat can quickly degrade the quality of the sunscreen. Once opened SolRX sunscreen is good for up to 12 months, after which you should dispose of it and use a new tube.